House is located in the Berlin district of Mitte in the Köpenick St. 47A, a dream location in the heart of Berlin-Mitte, with shops, restaurants, trendy bars, clubs Insider, trendy brunch cafes and nightlife in the south of the zone. Köpenicker straße is a quiet residential street. In few minutes walking you reach the popular Hackescher Markt, Unter den Linden, Museum Island, Friedrichstrasse and Oranienburgerstrasse with its leisure and shopping opportunities. You live very close to Ostbahnhoff with good connectivity to all in Germany or abroad. Fancy clothes shopping by themselves offer the famous avenue of chestnut trees (commonly known as jokingly "Casting Allee") with its many exclusive designer boutiques. The environment is one of the most vibrant and important in Berlin nightlife. A few steps away to the next U-Bahn (subway) Heinrich-Heine-Straße (U8) away. With public transport you quickly to some of the main attractions of Berlin such as the TV Tower, the Reichstag, the Brandenburg Gate or from your favorite location such as Alexander Platz. In the lounge there is 1 sleeper sofa that can be converted into a one double bed with linen, two lounge chairs with a round solid wood table or a glass table, dresser with a large flat screen TV, DVD player, stereo, two chairs made of solid Wood, 2 large floor lamps, a large dining table, where you can enjoy a dinner or coffee drinking, a large mirror. The floor is made of high quality laminate. In addition to the fully equipped with kitchen utensils for 12 people, the kitchen also has the following equipment: refrigerator, electric stove-Cerano, microwave, toaster, blender, kettle, coffee machine. The beautiful solid wood table with eight chairs is perfect for a breakfast (in the living room). The floor is made of high quality laminate. From living room you have access to the balcony, furnished with a table and two chairs made of wood and wonderfully suited for relaxing outdoors. In the corridors there is a leather bench, which can be used as a shoe closet, a dresser and a mirror. The floor is made of high quality laminate. The first Master bedroom has a double bed with linen and two bedside tables, 2 ceramic lamps and a leather seat. It is here also a work area with a desk made from solid wood and with a floor lamp on. The sofa with the square glass table is perfect reading, or entertainment. In the same room there is a place to sleep, since it is still a single bed or double bed with the bedside table and lamps can be provided. The floor is made of high quality laminate. The second Bedroom has a double bed with linen and with an antique chest of drawers, 2 designer lamps. The room is also reading corner with comfortable armchairs, a round wooden reading table and a high-quality lamp. The floor is made of high quality laminate. It can also be put in an extra bed. The third master bedroom has a double bed with linen and equipped two bedside tables, 2 ceramic lamps and an antique wardrobe. It is here also an extra single bed. Before bed is also a leather seat. For drinking coffee or reading this room has a circular cafe / reading table made of solid wood and two chairs. The floor is made of high quality laminate. The fourth Bedroom has a double bed with linen and with an antique chest of drawers, 2 designer lamps. In the room there is also Wardrobe, the round reading table made of wood and a high-quality lamp. The floor is made of high quality laminate. After the request is still 2 extra beds are provided. Overall, this apartment offers sleeping facilities for 12 people (4 double beds, 1 double sofa bed, and two single beds). Bathroom has two by hand wash-stand, shower (cabin), separate WC, 2 original 60's mirror equipped with lighting, heating towel rail, hairdryer and towels. The walls and flooring in the bathrooms are fully tiled. Other bathroom features by hand wash-stand, bath, toilet, an original 60's mirror with lighting, heating towel rail, hairdryer and towels. The walls and flooring in the bathrooms are fully tiled. 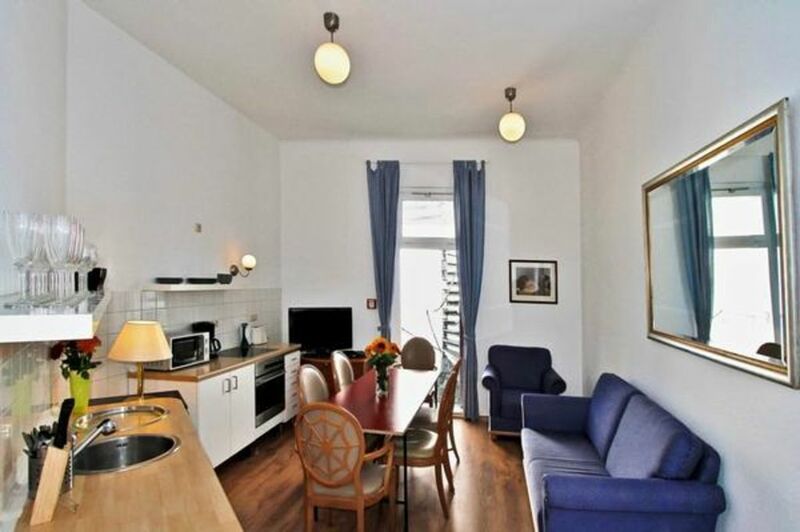 This apartment offers a mini-bar and a good selection of wines and champagnes, includes: Central heating in all rooms, Internet access, double glazing, ironing equipment available, chandeliers and modern designer ceiling lamps, hair dryer, TV / CD / DVD, cable channels, Berlin guide and travel guide. The bed linen and towels are provided. On request baby cot and ironing equipment is available. It has the parking possibilities on the street in front of the door or in the neighborhood. With the open window the street noise can be heard slightly. - Cot for children: once per object for rent at a price of 35 EUR (optional). Die Wohnung bietet viel Platz. Die Möbel hatten schon bessere Tage, sind aber funktionell, im Bad gibt es kleinere Schimmelflecken. Kontakt zum Vermieter, Abwicklung etc. waren nett und unkompliziert. The house is located in the district Berlin Mitte on the Köpenick St. 47A, a dream location in the heart of Berlin-Mitte, with shops, restaurants, trendy bars, clubs Insider, trendy brunch cafes and nightlife in the south of the district. Köpenicker Street is a quiet residential street. In few minutes walking you reach the popular Hackescher Markt, Unter den Linden, Museum Island, Friedrichstrasse and Oranienburgerstrasse with its leisure and shopping opportunities. They live very close to the Eastern Railway Hoff with good connectivity to all of Germany or abroad. Of fancy clothes to go shopping there is the famous avenue of chestnut trees (also popularly nicknamed "Casting Alley") with its many exclusive designer boutiques. The environment is one of the most vibrant nightlife in Berlin and important. A few steps away to the nearest metro Heinrich-Heine-Straße (U8) away. By public transport services take you to some of the main attractions of Berlin such as the TV Tower, the Reichstag, the Brandenburg Gate or favorite place you like Alexanderplatz.